With the recent passing of author Michel Parry (who wrote the novelization of Countess Dracula, as well as writing for Castle of Frankenstein magazine and publishing quite a few horror anthologies) I thought it was time to take another look at the one movie he wrote a screenplay for, The Uncanny. Tho it stars several high profile old school horror and sci-fi actors, it is virtually unknown in the U.S. because of it’s very limited distribution (I remember seeing it on a late night horror TV show as a kid, and liking it quite a bit). It still hasn’t had a U.S. DVD or Blu Ray release. It’s a three part anthology story of the sort put out by Amicus in the late ’60s and early ’70s (it’s so much like one of them most people probably assume it is one, but tho it was produced in part by Amicus‘ Milton Subotsky, it was actually put out by a small Canadian company called Cinévidéo). It stars Peter Cushing as a writer who has had several books published on conspiracy theory-type subjects like U.F.O.’s and the pyramids. He is trying to get his new book released by publisher Ray Milland in which he claims that humans are being controlled and manipulated by cats, who are highly intelligent and in conspiracy with each other to rule the world (if only he could see the internet circa 2014). He details 3 stories that are supposed proof (and he has all the eyewitness accounts and police records) of this. The first one is the old chestnut about the wealthy elderly woman (played by Mysterious Island‘s Joan Greenwood) who spurns her family and leaves all her money to her cats. Her nephew decides to take action with the help of her maid, but the cats have other ideas. The second story is about a little girl who lost her parents in an airplane accident. She has a black cat named Wellington that she adores, and together they move in with her cat hating aunt and uncle and their spoiled daughter who enjoys bullying her. As it turns out, the little girl is a witch, so things turn out bad for her tormentor. The last story is about a classic hammy horror actor (Donald Pleasance) who rigs an accident to kill his actress wife so he can replace her with his mistress. His wife’s cat takes revenge. 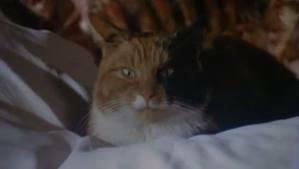 It is kind of hard to understand Cushing’s extreme fear of cats and insistence of their malevolence, since in the stories all of the people they hurt were bad people who deserved to be punished in a Tales From the Crypt-type fashion. The story is simplistic but pretty original overall- there just aren’t enough cat-themed horror movies around if you ask me. I guess the main difference between this and the above mentioned Amicus anthologies is that this one doesn’t quite have the style or charisma of those, which is mostly the fault of the fairly bland direction. To be fair, it is a ambitious project for a low budget movie made in a time before CGI. 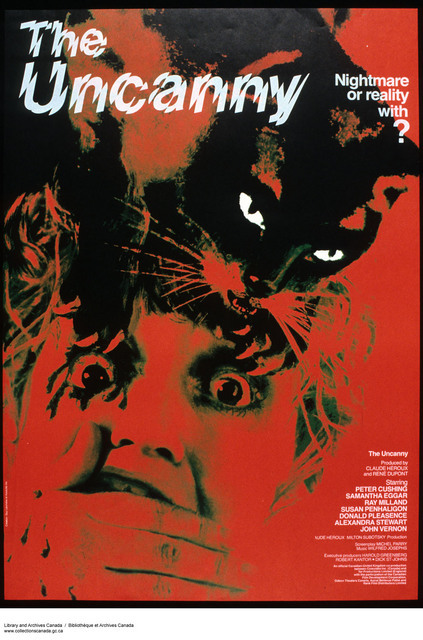 All the actors are well trained British character actors and take the fairly silly material seriously (Cushing, in particular, sells his paranoia and fear of cats with a nervous, twitchy performance full of dread). 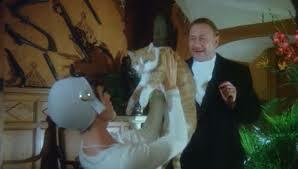 Donald Pleasance takes the opportunity to overact, clearly enjoying the role of an aging melodramatic horror star. In fact, I’d say it’s possible that he and his constantly mugging co-star Samantha Eggar might have been competing to see who could overact the most. And since their segment shows them filming a Poe adaption in 1930s Hollywood, I suppose the fit is right. 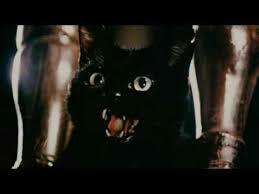 There is a multitude of cats in this, which was probably hard to film and control (there are a couple of humorous scenes where an obviously fake cat’s paw appears from off screen to scratch someone’s hand). The special effects are rough, even for this time period, but they get the job done. Despite the bland direction and unexciting special effects, it’s all fairly charming and entertaining (the score, composed specifically for this movie, makes it even more so despite a slapsticky little pratfall number during Pleasance’s segment I could have lived without) mainly due to the delightful actors involved. By 1977 this sort of quaint little charming horror movie wasn’t really made anymore, so it’s sort of an anomaly. As previously mentioned it’s all a bit silly but worth watching for fans of cats, Peter Cushing, Donald Pleasnace, or British anthology films. 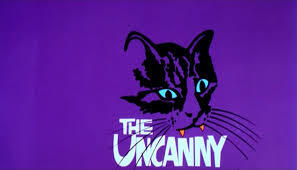 This entry was posted in movie reviews, The Uncanny (1977) by deadthyme. Bookmark the permalink.